I’m no fan of Twitter. My Twitter account @Mike_Hig aims to be the most boring in the world. I have six followers. I rely on journalists and others to wade through the twitterings of the twitterati to alert me to the glimpses of sense and wit that intelligent, sensitive people actually broadcast on Twitter. It is indeed a beautiful building, all the more thanks to a comprehensive £150-million refurbishment in 2013-14: https://www.networkrailmediacentre.co.uk/news/terracotta-decorations-complete-gbp-60m-redevelopment-at-nottingham-station#. The present Nottingham station of 1904, presenting a grand frontage with a porte-cochère to Carrington Street, replaced an earlier station that fronted Station Street. It was the Midland Railway’s response to the opening four years earlier of the grand Nottingham Victoria Station which served its competitors the Great Central and Great Northern Railways. The Carrington Street entrance building, bridging the Midland’s tracks, served to hide the fact that the Great Central’s trains crossed over the platforms of Nottingham Midland on a lengthy viaduct. Its alignment is now used by Nottingham’s NET trams. The brick and terracotta façade was the work of the same local architect, Albert Edward Lambert, who had designed Nottingham Victoria. He collaborated with the Midland Railway house architect, Charles Trubshaw, who had also designed the stations as Bradford Forster Square, Sheffield Midland and Leicester London Road, as well as the Midland Hotel in Manchester. The architects made full use of the repertoire of Edwardian Baroque – rustication, pediments, Gibbs surrounds – and provided elegant Art Nouveau wrought-iron gates, all intended to outdo Victoria Station across town. The platform buildings, in the same brick and terracotta, provided public facilities in rich interiors with glazed tiles, coved ceilings and elaborate chimney pieces, some of which survive. When the lines through Victoria closed in the 1960s, Nottingham Midland became the city’s only railway station. Remaining services that had used Victoria were shoehorned into Midland’s platforms, and trains between London and the North via Nottingham were forced to reverse, whereas before Beeching there was a direct line via Old Dalby. The recent restoration is a matter of pride to Nottingham people. The taxis have been turned out of the porte-cochère, which is now a light, spacious if sometimes draughty concourse leading to the dignified booking hall. Nottingham station is a place to linger, even if you’re not catching a train. It’s gratifying that more than one Twitter user thought of the building when they heard of the casualty-free fire. Friday January 12th 2018 was a hectic day in the centre of Nottingham. A police crime-scene had cut the tram service at Waverley Street north of the city-centre shortly before the station evacuation blocked tram services to the south and jammed road traffic in all directions. Then a city-centre power cut blacked out the shops and much of the Nottingham Trent University campus, and caused the Council House clock to chime and strike at the same time, confusing people with a plethora of bongs. This entry was posted in Nottingham's Heritage, Transports of Delight, Victorian Architecture on March 6, 2018 by Mike Higginbottom. 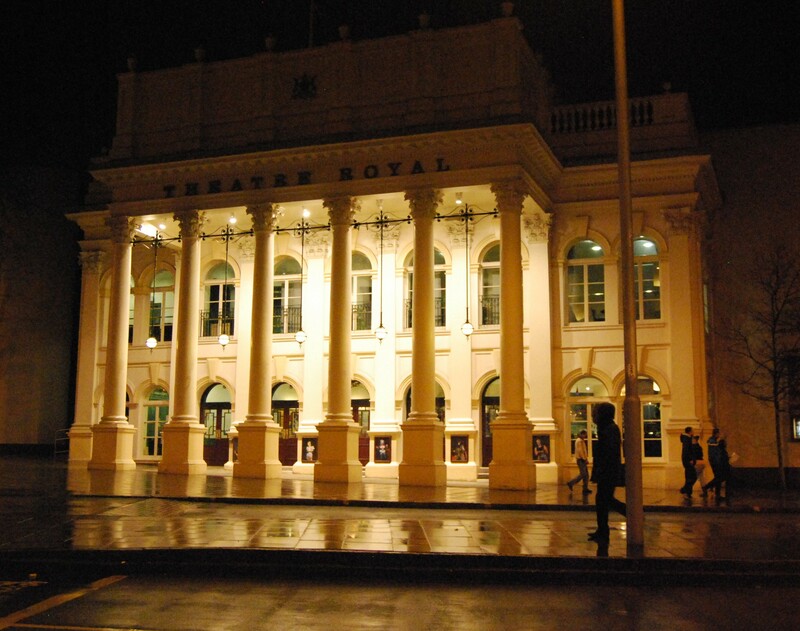 Diagonally opposite Nottingham’s Theatre Royal, the town’s prestige entertainment building of the mid-nineteenth century, stands the Elite Cinema, aptly and no doubt deliberately named as the city’s premier picture palace of the early 1920s. 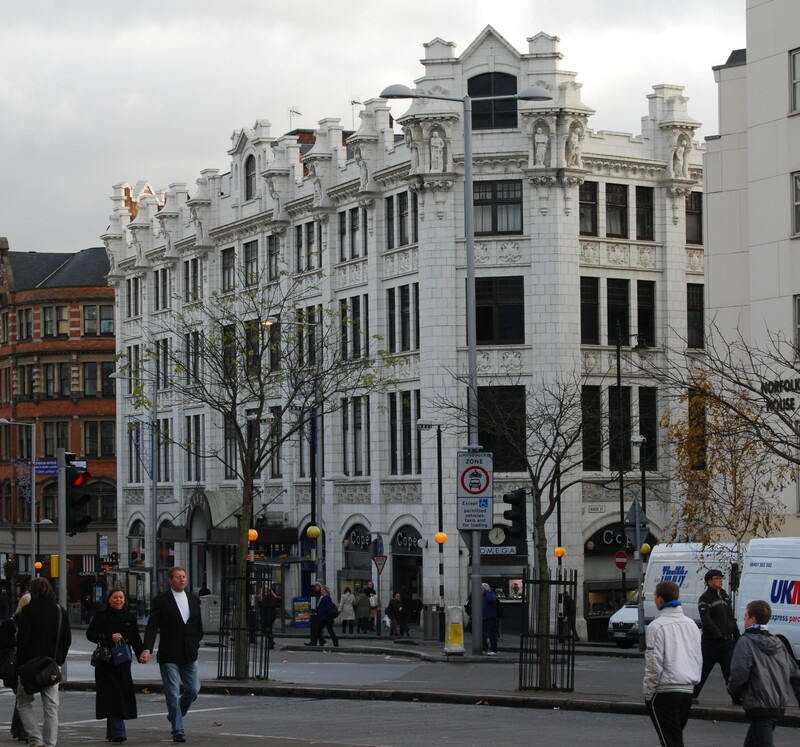 This huge building, clad in white Hathern faience with an elaborate display of statuary on its parapet, was designed by James E Adamson of the architectural practice Adamson & Kinns. The foyer welcomed patrons with a roaring open fire in the winter months, and there were two “swift and soft-running passenger elevators” to the upper levels. The auditorium, a confection in the style and colouring of Wedgwood ware, with trompe l’oeil arches and portrait medallions, brought a new level of quality and luxury beyond the picture palaces that had opened before the Great War. The Elite had a magnificent Willis & Lewis organ, “the largest and most complete instrument that has been built for any cinema in the British Isles”. The building was intended not only to show movies, but to build a separate reputation as a social and business venue. A suite of dining spaces offered catering for individuals and groups. The Louis XVI Café, white, green and gold, decorated with tapestries, contained a Soda Fountain “of the latest pattern”. The larger of two cafés on the second floor was decorated in Jacobean style. On the third floor there was another large room in Georgian style, “a thoroughly joyous room” decorated in a “daring” white and yellow scheme, and a smaller companion called the Dutch Café, “adorned by a very attractive hand-painted frieze illustrating scenes from favourite fairy tales”. The entire building was cleaned by a Stuyvesant Engineer centralised vacuum cleaner, “sucking up ravenously every particle of dust and small refuse and depositing it all, via a suction hose, in a central dustbin”, and in the aftermath of the Spanish Flu epidemic, the heating and ventilation system was designed so “that the ubiquitous influenza bacilli and their kin will have a difficult task to make both ends meet”. It opened on August 22nd 1921, and became part of the ABC circuit in 1935. Though repeatedly refurbished in the 1950s, it gradually lost its prestige as the years went by. Much of the décor survives because the Elite was listed as long ago as 1972, and was subsequently upgraded from Grade II to Grade II*. The fact that the Elite went over to bingo in 1977 helped to keep the place in good order, and after the demise of bingo in the 1990s the auditorium became a night-club. The building was advertised for sale at a price of £4¼ million in June 2015. This entry was posted in Fun Palaces, Nottingham's Heritage on October 8, 2015 by Mike Higginbottom. If, while dining in splendour at the Lakeside Restaurant, the former Bestwood Pumping Station outside Nottingham, your imagination wonders how much more splendid the place is than when it was a waterworks, you need only drive up the road to the Papplewick Pumping Station to see a similar installation that was and is even more splendid. The Papplewick Pumping Station was completed in 1886 after the Waterworks Company was taken over by Nottingham Corporation, and its construction was the responsibility of the engineer Marriott Ogle Tarbotton (1834-1887), who gave Nottingham its sewage system and the present-day Trent Bridge. The engine house at Papplewick was built of local Bulwell bricks with terracotta and Mansfield stone decorations. 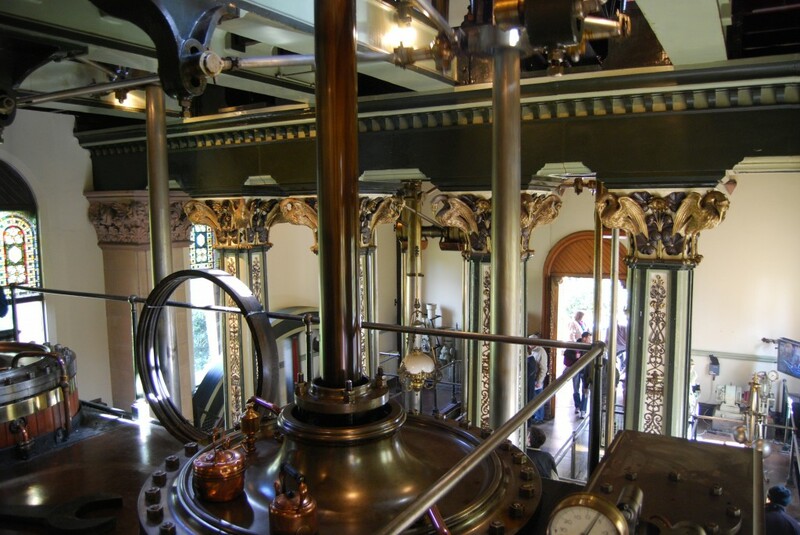 It contains two magnificent James Watt & Co beam engines, which pumped from wells two hundred feet deep. The building stands off-centre to the ornate cooling pond, suggesting that a second engine-house was considered, though it was not needed. Papplewick Pumping Station was given the same elaborate architectural treatment and landscaped grounds as Bestwood, but, apparently because the project – even with the ornamentation – cost £55,000, well under the £67,000 budget, it is more richly decorative, with stained glass, carved stone and ornamental brasswork designed around the theme of water and water-creatures. Brass fish swim between the individually turned brass water-lilies, reeds and bullrushes that decorate the square faces of the columns supporting the engine-beams and gilded ibis embellish the capitals. The sheer magnificence of the interior of Papplewick Pumping Station almost certainly saved the engines when it was decommissioned in 1969. The Bestwood engines were scrapped without controversy in 1968. The scrap value of the engines at Boughton Pumping Station further north near Ollerton was assessed in 1970 at £10,000, and the proceeds of that sale helped to set up the Preservation Trust that took over Papplewick Pumping Station and brought it back to life: http://www.papplewickpumpingstation.co.uk/index.htm. Opening and steaming dates and times at Papplewick Pumping Station are at http://www.papplewickpumpingstation.co.uk/html/dates_-_times.html. This entry was posted in Cemeteries, Sewerage & Sanitation, Nottingham's Heritage, Victorian Architecture on September 11, 2014 by Mike Higginbottom. 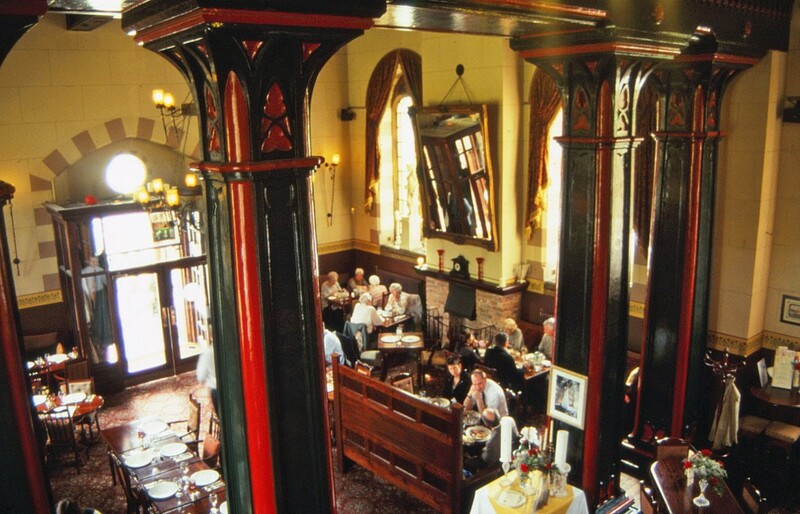 There can be few more splendid places to dine in Nottinghamshire than the Lakeside Restaurant [http://www.lakesidetower.co.uk/fine-dining-in-nottingham/pump-room-restaurant.html], a spectacular conversion of one of Nottingham’s fine Victorian water-supply pumping stations. Nottingham was the birthplace of one of the greatest British civil engineers of the nineteenth century, Thomas Hawksley (1807-1893), who specialised in water-supply engineering and served as consulting engineer to the Nottingham Waterworks Company. He was the first to prove it was feasible to provide twenty-four-hour supply, a convenience that made water-closets fully practical. He was responsible for managing the huge increase in demand as the population of Nottingham grew in the nineteenth century by tapping the abundant supplies of water held in the Bunter Sandstone that lies beneath the town. The Bestwood Pumping Station, built in 1869-73, was part of that great project. The brick engine house was built in thirteenth-century French Gothic style with stone facings. Its architectural splendour was a gesture towards the 10th Duke of St Albans, from whom the six-acre site was leased. He had rebuilt his nearby residence, Bestwood Lodge, in 1865, so the pumping-station chimney is contained in a 172-feet-high Venetian Gothic staircase tower which leads to a viewing loggia. The engines were constructed by Joseph Whitham of Leeds, with a capacity of three million gallons per day, drawn from a well 176 feet deep. They were replaced by electric pumps in 1964 and dismantled in 1968. Following a steeplejack’s report that the tower was unsafe because of mining subsidence, plans were announced in 1972 to demolish the historic buildings. When the Nottingham Corporation Waterworks Department was taken over by Severn Trent, Bestwood Pumping Station became derelict, listed but unusable, until 1997: http://www.lakesidetower.co.uk/home/photo-gallery.html. In fact, its architectural merit made it a superb location for an upmarket restaurant and wedding venue, with a fitness suite in the former boiler house. The main floor, the Pump Room Restaurant, is flamboyantly decorated in Victorian country-house style, and the beam floor provides a further function room, the Tower Suite. It’s an indication of the pride that Victorian municipalities took in their utilities that this practical waterworks should so successfully become an elegant place for fine dining. This entry was posted in Cemeteries, Sewerage & Sanitation, Life-enhancing experiences, Nottingham's Heritage, Victorian Architecture on September 6, 2014 by Mike Higginbottom. Nottingham’s City of Caves attraction shows what remains of the Drury Hill cave-system, named after a street that was swept away to make room for the Broadmarsh shopping centre which opened in 1972. 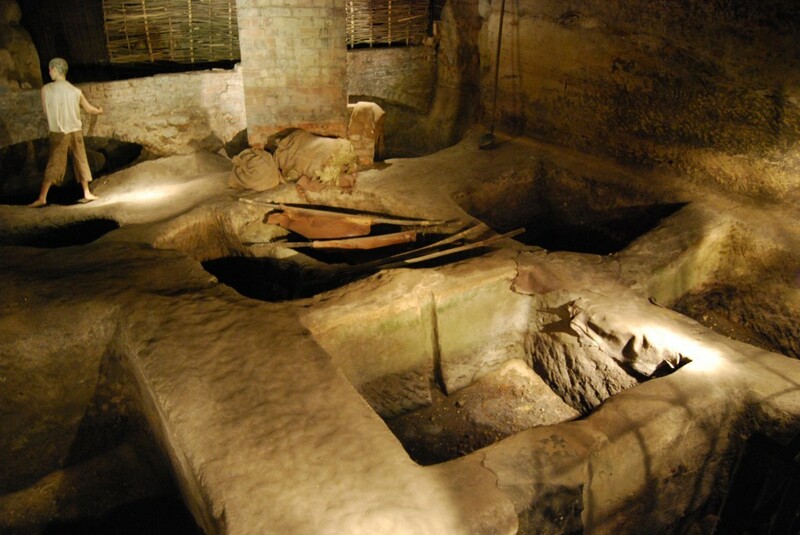 The complex includes the only underground tanneries in Britain, if not the world, dated, by pottery found in the cess-pit, to 1270-1300, and known to have been used as late as 1639. The tanning process was so obnoxious, involving soaking hides from the slaughterhouses in vats of urine and ordure, that the caves were rat-free and the tanners, who had little else to be cheerful about, were notably immune to the plague. The City of Caves website is at http://www.cityofcaves.com. It’s a good idea to switch your computer to mute. This entry was posted in Nottingham's Heritage on January 23, 2014 by Mike Higginbottom.